There has to be an acknowledgement here: few could have predicted that by the end of the 2019 Asian Cup, Qatar would have made the headlines as a graciously growing football nation. 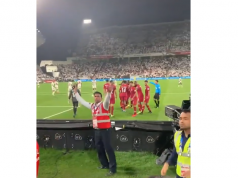 Rabat – Qatar surprises Japan with a deserved 3-1 win Asian cup final, making history as it prepares to host the 2022 World Cup. There was, as has been case with tale Qatar’s display impeccable at this tournament, pace, width, and aggression in the first half. While the pace and width was Japan’s, the aggression was Qatar’s. Japan may not have made the miracle of the 2018 World Cup when they honorably lost 3-2 against Belgium. But many of us still remember the Blue Samurais as the revelation of the latest world cup, showing glimpses of great and exquisite football capable of achieving the kind of victory that eluded them in Russia 2018. Japan was good, as usual. With an unswerving faith in their attacking philosophy, the Samurai evinced depth and tactical brilliance, mainly mastering the middle field and operating through beautiful one-two passes to try and unseat Qatar’s defensive citadel that registered no single goal until this phase of the tournament. But try as Japan did, there just seemed to be an inescapable sense of purpose to Qatar’s play. Sometimes, dominance and superiority make one blind to obvious weaknesses. And Qatar was quick, through a succession of rapid transitions down the flanks, to exploit the intermittent errors of Japan’s attack-minded play. The effect was quick to come by as Qatar slowly grew into a math they may have entered with most suspicion and reserve than they had in previous outings. At the 12 minute, Almoez Ali, feeling that the onus to was his breathe some fresh into his mates was, thumped in Qatar’s and the game’s first goal. By resorting to direct play to unnerve Japan’s otherwise formidable team, Qatar went again and again to threaten and impose pace and grace. That resulted in a second goal barely a quarter of hour after the first. Receiving a lovely earth-bound ball, midfielder Abdulaziz Hatem attempted a magnificently curled ball from distance, trumping Shuichi Gonda, the Japanese keeper. 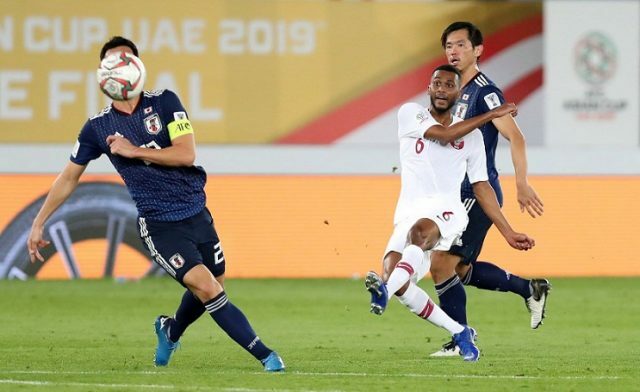 At 2-0 down against a side that had succeeded to keep clean sheets in all their previous outings here in the UAE, Japan knew this could be it for them. But the Samurai’st first reaction was to attack even more, showing belief that perhaps a miracle was possible. In the second half, the Japanese squad pushed indefatigably, spiritedly looking for a goal that could revamp their aspirations of continental championship. Meanwhile, Qatar waited, tactically counting on rapid transitions and the counterattacking prowess of the Qatari youthful squad to hammer home a third goal, a final straw to smash Japanese hopes. With a 60 percent ball possession, it hard to say that Japan was utterly dominant, but the energy and the will was there. If anything, the first 15 minutes of the second half registered no major eventful occurrence, with both sides putting in their best to thwart transitions. By the time the clock read 60 minutes, Japan seemed rejuvenated. In a moment of inspiration fifteen minutes before the final whistle, forward Takumi Minamino sliced up a brilliant ball over the Qatari goalie. That goal, the first that Qatar conceded at the tournament, changed the dynamics of the game. At 2-1 ten minutes before full time, the question was no longer whether Qatar could end the tournament without conceding any goal. Rather, the question now was if the Gulf country could resist the regained buoyancy of a Japanese squad that kept coming for an equalizer. But those sour minutes did not last long, at least from Qatar’s perspective, as a 83 rd minute penalty ensured a 3-1 victory by full time, giving Qatar the undisputed upper hand in the final of a tournament where most people would have written them off. Who can now say that this team does not have what it takes to pass the group phase at the World Cup they will host in 2022?